While it is of course annoying when the profile of a winery changes shortly after you publish a regional wine guide, if it’s a winery owned by people I like, then I’m happy to see it. Such is the case with Comunica who, in 2014 after we released the Montsant wine guide, moved their whole operation from the winery of Pascona where they were renting space to a brand new, purpose-built cellar on the neighboring property of Mas d’en Cosme. For those who may not be familiar with Comunica, the two owners behind it are Pep Aguilar and Patri Morillo. Their longstanding partnership started years ago when they met each other on a commuter train while studying and having to endure a lengthy trip each day from the outskirts of Barcelona to the interior of Catalonia. Eventually they found themselves to be roommates with other students, sharing a flat with a couple of other girls. One of which Patri ended up marrying and another ended up being enologist Anna Espelt who directs her family’s very successful winery up in DO Empordà now. Finishing their studies they began to work for a long list of cellars and eventually they formed their enology consultancy fittingly called, “ya le llamaremos” which in Castilian means, “we’ll call you”. 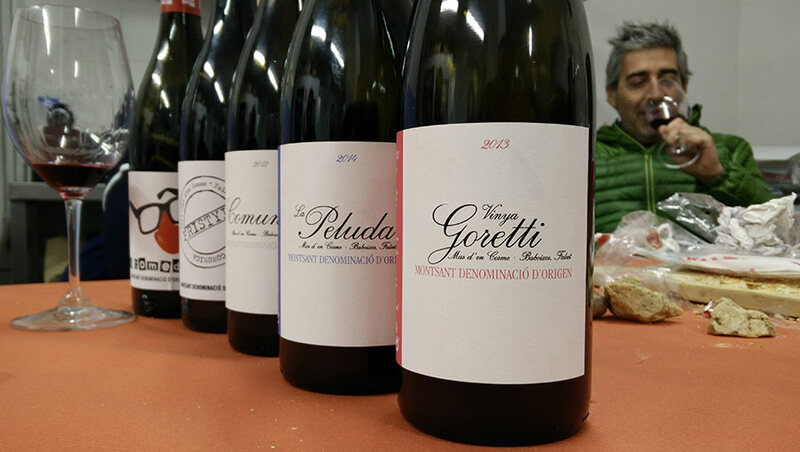 Eventually they formed a plan to create their own wine label in DO Montsant in 2010 and call it “Comunica” to keep with the theme that they’re always on the phone and well, communicating whether via the bottle or the phone. In 2014, they somewhat stumbled upon the new cellar as they were looking for a new place to expand and the owner of the property was looking for someone to rent the space as well as buy his grapes from what ended up being a slice of excellent granitic soils near Falset. They scrambled to get everything ready in time for what ended up being the very difficult 2014 harvest but in the end, they pulled it off and now have the 2015 vintage sitting in the tanks of the new digs. The move afforded them many things in addition to their own space and 7ha of vineyards to work with. They were able to redesign the wine labels and overall image to be more classic and French in design. They also created a couple new wines such as La Peluda which is 100% Hairy Grenache from an old vineyard and Fristyle which is a fully natural, zero-sulfite wine. Of course, the only real difference is the complete lack of sulfites as all their wines are made with spontaneous fermentation and with absolutely no oak barrels. They find, as many do these days that oak is masking the soil aspects that they’re purposefully desiring to show. It was great to see the changes and hang out with Pep (as well as his French bulldog) for the morning as we sampled the new offer and saw that he and Patri have made impressive work in the trajectory of their wines. Mix of dark and red fruits in the nose over clay aromas. A touch herbal with orange peel notes as well. Medium acidity in the body, light on the palate and a clean, well-executed finish. Touch volatile in the nose with lighter bell pepper, red fruit, and a pinch of saline aromas. Very light in the body with a definitive medium plus acidity although the finish comes up a bit short. Can vary a great deal depending on the day you taste it. Rich ruby color, red fruits in the nose with a touch of chocolate, stony granite, and floral violet notes. Light and balanced in the body with lively fruit in the mid-palate as well as in to the lingering finish. Shows an excellent evolution in quality when compared to previous vintages. Highly aromatic as one should find in a well-made take on this type of Grenache. Touch of anise, wild herbs, fresh red fruits. Light and extremely delicate in the mouth with medium plus acidity and a simply excellent, lingering finish. This wine was known as “Comunica Samsó” prior to their image change and is from a 70 year-old Carignan vineyard in the village of Marçà that yields production of only 1,200 bottles. Highly herbal with fresh green notes that are earthy and wild. Juicy and fresh in the mouth with medium plus acidity. Meaty, with plenty of spine and a small hint of violets as it opens. Will not seem like Carignan to those who know the grape as it comes across nearly identical to a fine, Northern Rhône Syrah.